At harvest time in Scarfolk, families donated food, household items and other objects they were going to dispose of anyway, to people who were too indolent to go shopping themselves. Canned products were most often donated (because they are easier to throw), but that ceased in the mid-70s following a food scare. 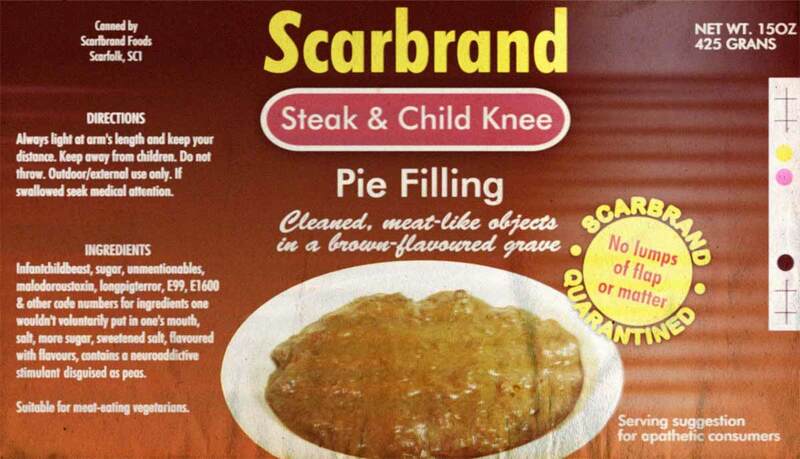 Tests on Scarbrand's meat-flavoured pie fillings had shown that each can might contain up to 7% ergot-impregnated stoat faeces, which had most likely leaked from a farm that specially bred animals and children for pagan rituals. Scarbrand admitted culpability but did not recall their products. They maintained that most customers weren't qualified or even clever enough to notice the contamination because the genuine, non-faecal ingredients were so similar in colour, texture and odour to the faeces that they were virtually indistinguishable. Secondly, the hallucinogenic ergot content was so high that the vast majority of affected customers would not be able to remember their name, or even that they were human, much less complain about the pie filling. Scarbrand's public relations director publicly ate stoat faeces to demonstrate that it would not have any adverse effects. However, when he and several consumers fell ill and hijacked a garden centre which they tried to drive to the Lake District, Scarbrand relented and advised consumers to discard the questionable 7% of their pie fillings. They even incorporated the message into their TV ad campaigns. "Only greedy people eat ALL their food. Scientists have proven that eating more than 93% of your food could affect your health". By the end of the 1970s, with no improvement in consumer health, Scarbrand was forced to provide the ergot-laced stoat faeces in a separate sachet. Back in 1973, residents of sparsely-populated North Scarfolk wrote to Father Christmas and asked if they could have independence. The North Scarfolkians had long felt that South Scarfolk had taken advantage of their natural resources - seashells - which they painted with pretty colours and glued together to make funny little characters and animals. These novelty items were valued as far afield as Wales. Scarfolk Council eventually acquiesced. It granted North Scarfolk its independence and made it a gift of an unassailable, wall-shaped monument to celebrate its new-found sovereignty. 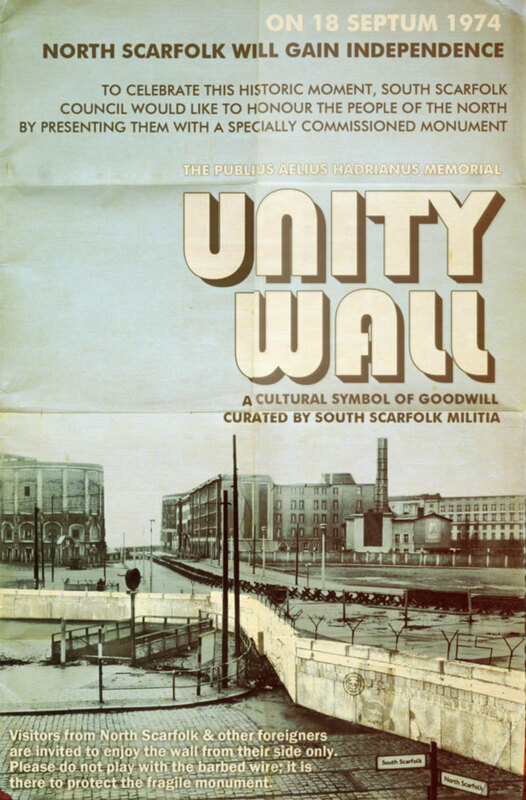 The 'Unity Wall', as the south preferred to call it, also provided protection and comfort: The council was worried that North Scarfolkians might inadvertently fall off cliffs into the sea, so it made sure that the wall completely surrounded North Scarfolk. Positioned along its length were armed 'monument curators and attendants' who protected the wall for the North Scarfolkians and made sure they didn't accidentally wander out. Occasionally, a few bad-mannered people from the North, who did not appreciate this artistic symbol of harmony, tried to spoil it for everyone else by attacking the wall, and the curators were forced to benevolently shoot these people for the sake of peace and brotherly understanding. But on the whole, Scarfolk Council found North Scarfolk to be both amicable and manageable, so much so that it sent all its criminals to live there, presumably so that they could learn from their virtuous neighbours. 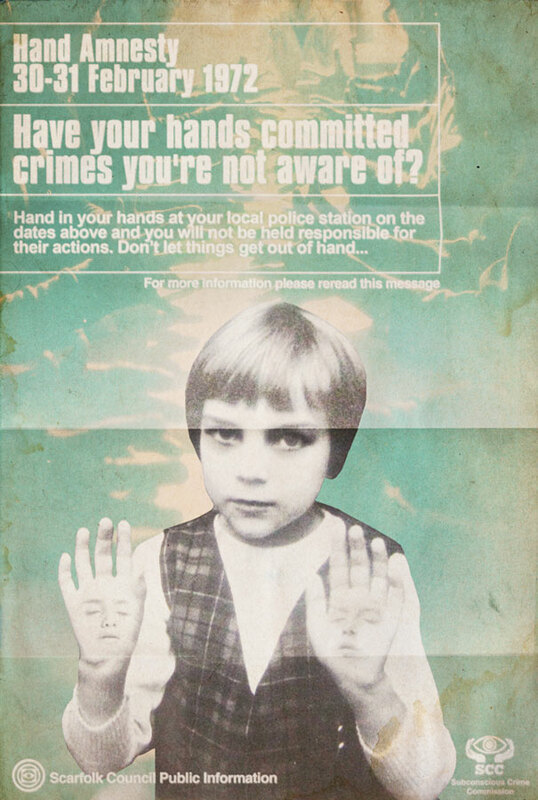 You may recall that we recently touched on crime in Scarfolk. One ubiquitous problem was 'subconscious crime', which was so prevalent in the 1970s that the council was forced to take drastic measures. Although it had complete faith in the integrity and innocence of it citizens, the council did not trust their hands. What were the town's approx. 80,000 hands doing and who were they talking to? There was no way of effectively monitoring or policing the situation. That's why in 1972 the council offered its first Hand Amnesty and announced that no legal action would be taken against citizens if they turned in their hands to the police. A week before the amnesty date, each home received through the post a parcel containing a local anaesthetic, a miniature hacksaw (or sharp spoon, for working class families) and a raspberry lolly (as an incentive to carry out the necessary procedure). However, many citizens were confused. If their hands had committed crimes without them being aware of it, how would they know if they were guilty or not? The average person had neither the time nor the resources to systematically surveil their own hands. 1. If you are already conscious of your subconscious crime please take advantage of the amnesty and surrender your hands to the police. 2. If you do not recall committing a crime, it is likely that your conscious mind is suppressing the memory of committing a crime. Please take advantage of the amnesty and surrender your hands to the police. If you fail to comply with either 1. or 2. you will be visited by council surgeons. They are on hand 24 hours a day to give you a hand handing in your hands. One health- or community-care professional per 10,000 citizens had long been considered extravagant so when the region was hit by a recession in 1972, Scarfolk Council was forced to make cuts. 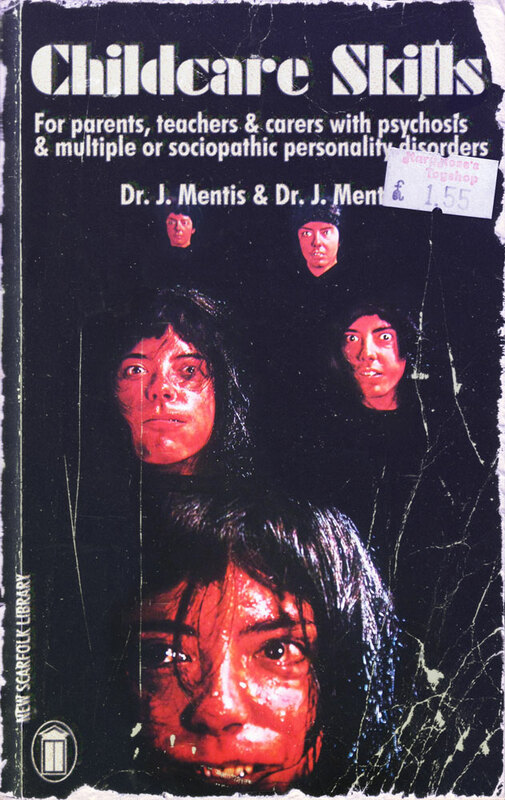 To reduce costs but maintain the workforce, the council shrewdly decided to employ only people who suffered from multiple personality disorders. For example, Scarfolk's under-12s coven had always operated with a fulltime staff of 7 with an extra position for a sacrificial martyr, who was employed on a short, fixed-term contract. After the cutbacks were introduced, the coven was reduced to one staff member, Donald Kissme, who fulfilled all 7 fulltime roles with 7 separate personalities, not to mention a couple of superfluous ones, including a 18th century pirate and a Swiss truck driver with cathisophobia. The short-term, sacrificial martyr positions were not subject to cutbacks as they helped reduce expenditure in the region's orphanages and state-run elderly care homes.